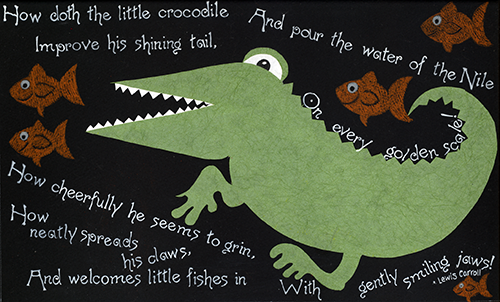 A playful illustration of a Lewis Carroll poem, How doth the little crocodile… I’ve been using watercolor since the good old days with those pan paints and horrid brushes and colored pencil since I could hold a the darn thing. Something I always wanted to experiment with was collage and cut paper on black paper is so striking, I can’t resist. 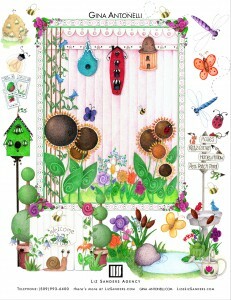 At Home with Zada is a mixed media piece from Life in Scilly. 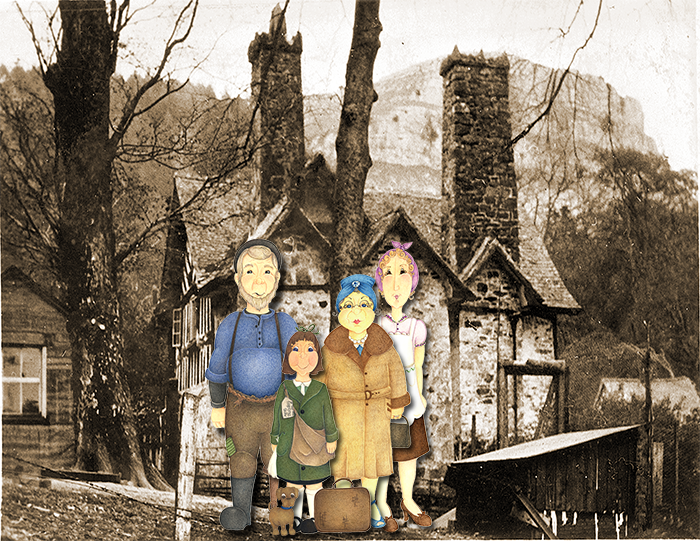 An unassuming cottage in the country side that ends up being full of adventure. 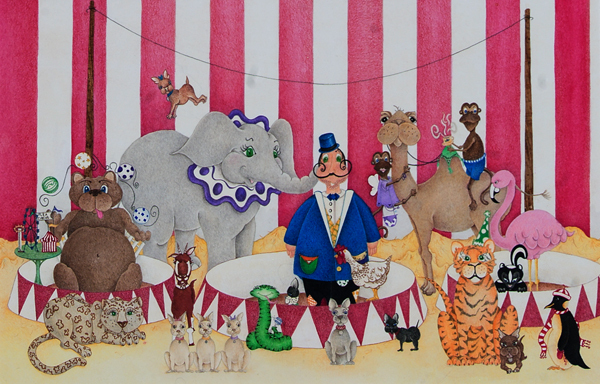 B. Bumble and his Circus are characters from one of my books needing a bit of visual representation to bring them to life. Everybody is there; even the flea circus next to the juggling bear. This is one of my favorites and was so much fun to create. 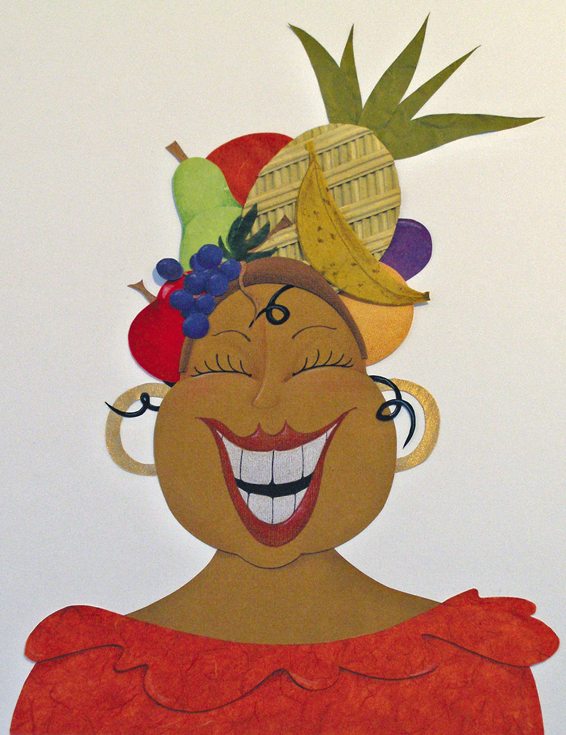 It gave me a chance to dig deep into my flat file full of pretty paper and create this happy piece. The pineapple is actually corrugated cardboard. 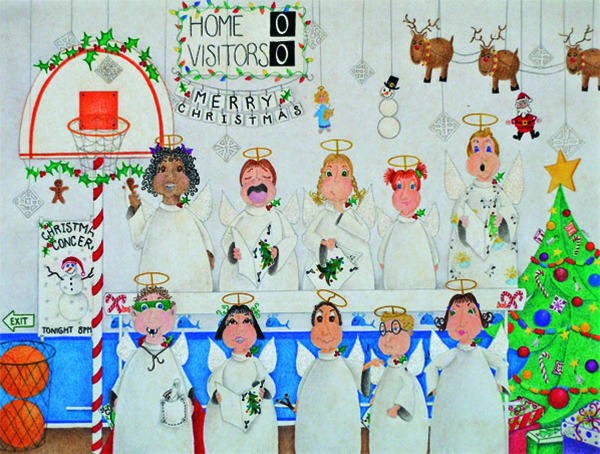 This Christmas Pageant piece was the result of working with an author on her story about a Jewish girl in a predominantly Christian world. Obviously this image illustrates the school pageant with all the various children you might see there. The boy in the upper right doesn’t seem to notice his costume is not quite like everyone elses. The bully is in the middle of the front row tugging on some poor kid’s wings is annoying what’s her name on the bottom right. I think it tell a nice story in itself. 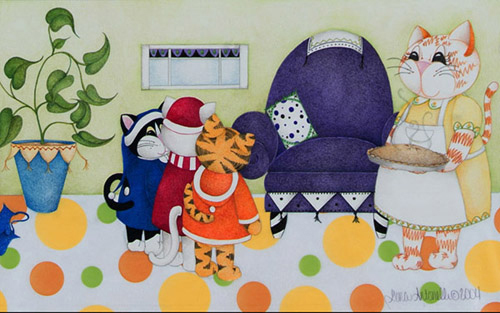 Three Little Kittens is based on the classic nursery rhyme using watercolor, colored pencil and collage. 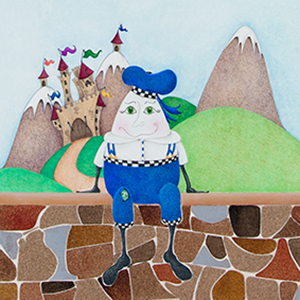 Watercolor, colored pencil and a great wall constructed out of painted sandpaper created Humpty’s great wall. Barking Mad Web Collective was born due to the fact it was the name I kept coming back to. Graphically I saw so many possibilities that I was hooked! Wanting something playful and kitschy I started with the idea of a dog in the logo. And once I did further exploration into potential font choices it helped to further refine the image to accompany it. How true it is that sometimes your best ideas are born with the least amount of effort! The tagline I created, “Complex Creativity Mixed with a little Crazy” was a late night addition that fit perfectly even after the sun came up. Not often am I so fortunate as that but it’s great when it does happen that way. These are various version of the logo created for different purposes such as a facebook header, twitter favicon, or business card usage. 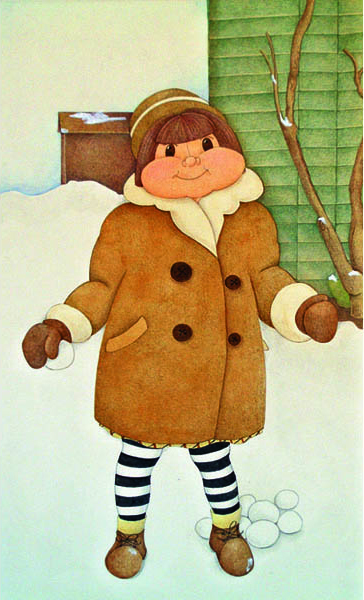 This watercolor and colored pencil illustration is based on a photograph of my Grandmother as a child. My favorite part is the black and white striped stockings. Originally they were just a solid color but I have another photo of her with some striped socks which inspired the change in her wardrobe for this piece. 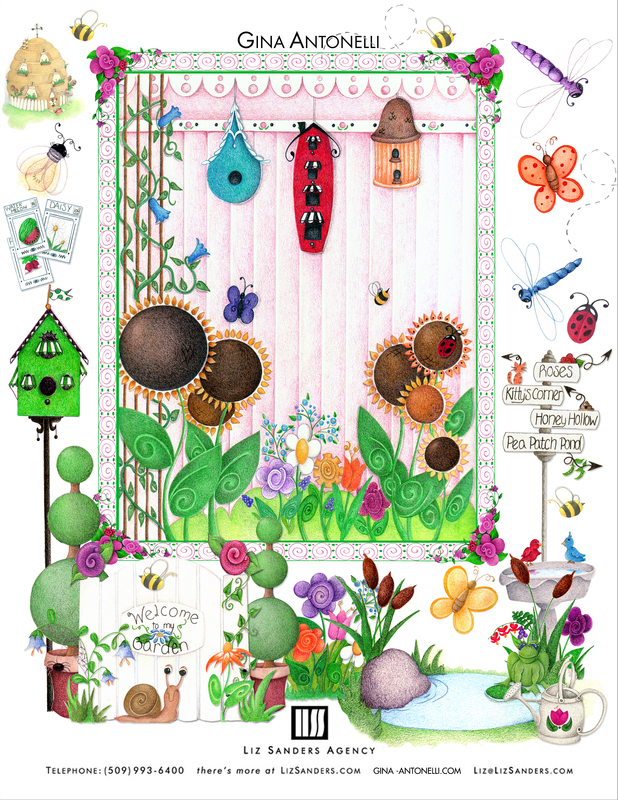 This garden themed page was created for the annual Picturebook of Illustrators using watercolor and colored pencil.